All 3 teams play today and to give you an idea on how close they have become, all 3 teams are committed to watching and supporting each other. Pretty cool. Boys A start us off and lay an egg, losing 4-0 to Swedish team. Better days ahead and they just did not play well today. Boys B put Germany game behind them and won 3-0 vs. a Swedish team with goals from Cory, Hamza, and Donnovan. Bboys played very well. 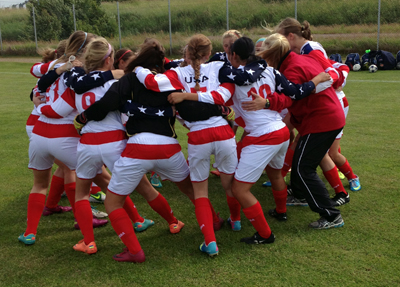 Girls finished the day with a crazy 4-3 win as they should have closed out their Swedish opponents early but did not. Goals from Allie Gipson, Amber 2, and Payton sealed the deal. 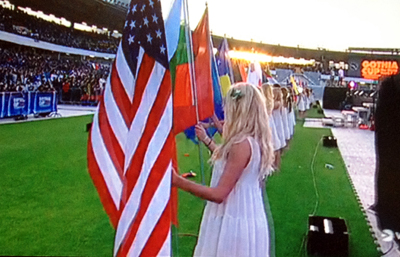 All 3 teams sang and chanted and they were getting ready for the finale of the day, The Gothia Cup Opening Ceremony. What a night, crowd of about 50,000 and a gerogeous night, I have attached a few pics and videos but we had several parents take loads of pics and will post them soon. A truly gifted night for us and what a privilege to march in the opening representing our country. 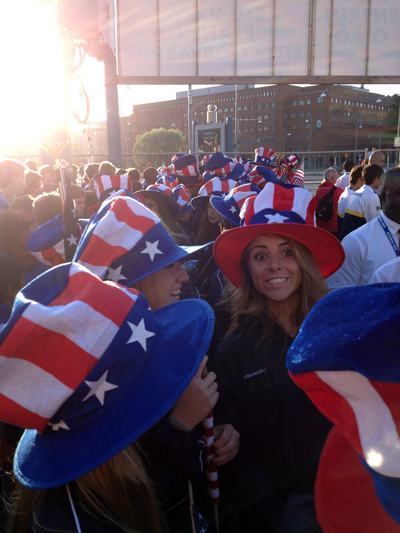 We had our USA flags, hats, and of course our jerseys. Such a wonderful experience. 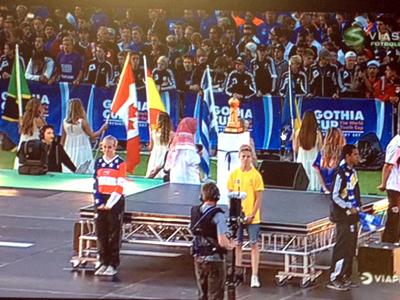 And to top it off, our own Megan Pitcock read the oath and declared the Gothia Cup 2013 open, tremendous moment for her!!!! As I say annually, the World Cup is an event each soccer fan needs to attend but the Gothia Cup is an event that each soccer player needs to participate in. Such a global event and so organized, its awesome. Just look for the videos and pics. Kids in bed by 11 and geared up for day 2 tomorrow.